Unfortunately, it still appears as though Europe’s top policymakers – that is, the Germans – are trying to “muddle through”, as opposed to coming up with a good, powerful solution. To understand this situation, it is instructive to reflect on Spain’s “problems” in comparison with those of Greece and perhaps Ireland. While Spain’s widely cited problems of high unit labour costs and current account deficit are symptoms of it sitting inside a rigid currency zone, before 2007-08 these problems existed but were not highlighted. They were seen as an understandable consequence of a monetary union such as the euro area. If you have a currency union with different savings rates and levels of competitiveness, it is inevitable that some countries will have current account surpluses and others deficits. Within national borders, regions have deficits with others that have surpluses. It happens in the UK and the US. Before 2008, Spain was frequently lauded as being the euro area’s top job creator and for having among the lowest public-sector deficits and debts. Until the recent collapse of the economy and the government having to take on the obligations of the increasingly indebted private sector, Spain’s debt levels appeared better than many core eurozone countries, including Germany. This is in marked contrast to Greece, which has persistently flouted eurozone deficit and debt criteria. When the euro was introduced, there were no stated criteria about countries running current account deficits or surpluses. In hindsight, this might have been an error but in my view it is not clear that it was. It is highly improbable in any currency union that all areas can have external balanced current accounts. To do so would be to achieve quite a nirvana state. In any case, there is some evidence Spain’s unit labour costs have improved on a relative basis in the past couple of years and its current account deficit will soon vanish. Some believe Spain will have a current account surplus in late 2013. So what is Spain’s real problem? The answer to British readers is pretty familiar – a large housing market boom that has burst. The consequences for the economy as the fallout grows are all too predictable. Spain is now facing a severe recession and without lower interest rates, some ability to stimulate growth through the government (close to impossible in the current circumstances) or some other offsetting external factor, there is no sign that it will come to an end. I say familiar to British readers as this was the problem in 1992 when the UK chose to leave the European Monetary System and the Exchange Rate Mechanism (ERM). Spain’s option is to leave the eurozone. But – as we have all become accustomed to hearing – eurozone policymakers claim that this is not an option. Without a solution to lower interest rates to help Spain to get some benefit from its policy adjustments, what is the eurozone offering Spain? If the country simply persists in trying to reduce its debt by tightening government spending and raising taxes even more, all it will guarantee is even weaker growth and higher unemployment – which might in turn result in greater Spanish debt, not less. The solution lies beyond Spain and partly in Brussels, but probably much more in Frankfurt and also Berlin. 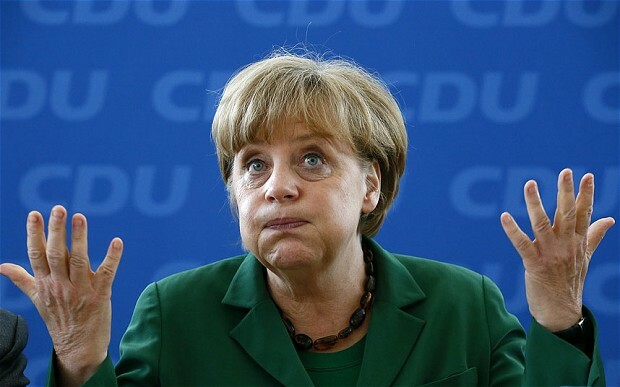 Does Germany really want the eurozone to persist? Its policymakers make it generally pretty clear that they do and quite often express a vision of a United States of Europe with greater fiscal and political union. If it is a serious goal, then Germany has to start offering some carrots as well as all the sticks it seems so ready to brandish. For Spanish citizens, especially the rapidly rising legions of the unemployed, having German or Brussels policymakers scrutinise Spain’s budget policy is not especially appealing unless they see some clear benefit. In our July Monthly Insights, Anna Stupnytska, James Wrisdale and I show that both Spain and Italy desperately require lower bond yields. Even with an ambitious forward plan for genuine euro-denominated bonds, unless such future plans bring yields down sharply then these two countries will be in trouble, and hence probably many others will be, inside as well as outside the eurozone. As Moody’s negative ratings watch on German and other AAA rated euro members, Austria and the Netherlands, highlighted last week, the fiscal consequences of these countries being required to bail out Spain or Italy would cost them dearly. For this somewhat obvious insight, the credit ratings agency will have strengthened the backbone of the conservative policy wings in Berlin. So the notion of levering up the European Financial Stability Facility seems an unlikely solution. Of course, some may argue it also puts paid to any slim chance of Germany agreeing the framework for eventual eurobonds. But I am not sure this is right, unless you are looking for reasons to dismantle the whole euro project. That being said, if Germany really does not want to consider the ultimate logical consequence of eurobonds, then perhaps – as messy as it would be – they should stop the project now. As we demonstrate in the July Insights, if you could combine forward commitment to eurobonds, together with the belief that Italy and Spain can increase their real GDP (and maintain primary surpluses) it is quite believable that euro-wide bond yields would settle somewhere between 4pc and 5pc. This would be perfectly consistent with long-term trend growth of 2pc with inflation as desired by the ECB at 2pc. In the absence of such a commitment, or in the interim, the only possible solutions lie with the monetary authority, namely the European Central Bank (ECB). Many, especially the conservative members, hide behind various aspects of the ECB’s legal status and talk about how the central bank can’t monetise debts of member countries directly. But what is so special about the ECB that doesn’t apply to other central banks in challenged Western economies? The euro area GDP weighted deficit and debt levels are lower than the UK, the US and Japan. Despite these facts, the current bond yields in all three appear to be a safe haven away from the euro area. This can be true only because markets value their role in guiding both interest rates and general monetary operations. In contrast, inside the euro area, many countries’ bond markets have become dysfunctional with very few, if any, non-domestic conventional government bond investors prepared still to participate. As a Goldman Sachs colleague suggested to me recently, the bond markets for the periphery have essentially become akin to distressed debt markets, usually a highly specialised and often illiquid market. The ECB has to start asking itself more searching questions, and soon. How can it be an effective central bank if it can’t influence overall financial conditions in the euro area? And of course, if the escalating pressures continue to rise – resulting in a collapse of the eurozone – the ECB would cease to exist. What is the great benefit of the degree of independence to which some ECB members occasionally aspire, if it can’t help ensure the euro survives? The ECB needs to introduce new ideas. In answering some of the IMF’s highly commendable proposals for solving the crisis, the bank’s president, Mario Draghi, responded that there are no “taboos” for the ECB. On Thursday, Draghi backed this up with even stronger statements suggesting that the bank is prepared to intervene in sovereign spreads. That needs to be demonstrated. As 2012 creeps forward, there is accumulating evidence that the world economy is slowing down. Inside the euro area, it is quite evident that a recession is present and it is getting worse. The July “flash” PMI survey of business confidence was not much weaker than June, but within the estimate there were some troubling signs, notably the sharp deterioration in Germany’s manufacturing PMI survey. There are also signs of slowing in other key parts of the world, especially the all-important BRICs (Brazil, Russia, India and China). The US has also slowed notably since the late spring and given the importance of the US for the rest of the world, that has its own consequences. The slowdown in the BRIC economies – China and India in particular – might contain a silver lining for the euro crisis, namely the decline in energy and some other commodity prices. Inflation in China has fallen sharply so far in 2012, indeed, the June CPI of 2.2pc is significantly below the 4pc target that the authorities have set for the year. British policymakers need to be careful that they don’t inadvertently exaggerate the negative consequences for the UK from the euro crisis. There is little that they can do about exports, but they can at least ensure that the UK’s financial conditions do not tighten to an inappropriate degree because of tightening eurozone financial conditions. With Spain in the euro spotlight, it is now time for action. On its own, Spain cannot do more. Germany and the ECB need to decide the role they want to play and what they want the future of the eurozone to be – continuation or break-up. And once they have done that, they need to get on with it.